Since we entered the Chesapeake Bay, the mood and our routines on Boundless have changed. Erin spends any time she can on her phone texting and talking to friends. Sunset? What sunset? I’m busy texting. Andy is feverishly trying to finish coding his last video game for his homeschool class, so he can publish and sell it on the Steam video game marketplace. Doug’s shifted from boat planning to home planning. He’s created a To Do list of home tasks, ordered things we need from Amazon and figured out the details of getting a boat captain’s license. I’ve gotten nostalgic about the trip and keep bringing up discussions about our favorite places, people and activities and how the trip has impacted us as individuals and as a family. As a family, we all agree that we know each other much better than we did before. Before this trip, Doug and I tried hard to prioritize family time. We prioritized family dinners most nights, family sailing weekends whenever there weren’t sports, music or school activities, and regular family vacations. But with busy lives all around, it was imperfect at best. Spending almost 7 x 24 together for a year certainly changed that! Particularly as we all took on new challenges and experienced new things together. I’ve learned that when faced with a stressful situation, Andy is a rock we can all rely on. He stays calm, asks questions, and executes. And I’ve learned to look to Erin to break down any social barrier. Like when we’re struggling to communicate with someone in another language. She jumps in and figures out how to get the idea across and often makes everyone smile or laugh during the process. Getting to know each other went both ways. Erin likes to say that she and Andy got to know me and Doug as people, not just parents. I think she means flaws and all, but that’s OK. They saw us having fun, stressing out, loving each other, being frustrated with ourselves and each other, solving problems together, etc. No talking things out after the kids go to bed. It was all there for them to see and hear. And we’ve learned to truly rely on the kids. As their sailing skills and experience increased throughout the trip, we moved from joint watches to single watches with a parental backup if needed. As Andy mentioned with pride the other day at dinner with Doug’s Aunt and Uncle, he’s learned to be comfortable taking 2-hour watches “while everyone sleeps”. How will this impact the kids in the future? I don’t know, but I hope it will breed a deeper level of self-reliance and confidence. And to the often-asked question of “What’s Next?”, for the kids there’s an easy answer. Andy is headed to Europe in mid-July on a Virginia-wide high school band trip, returning in time for summer marching band camp before starting his junior year. Erin has decided to shift her focus from soccer to theater and will spend the summer at a Shakespeare theater camp before starting her freshman year of high school. What’s Next doesn’t have quite as clear an answer for me and Doug. Neither of us plan to jump into anything big right away. We have a lot of boat and home tasks we want to complete (as documented in Doug’s ever lengthening To Do lists!). And we’ve both decided to pursue getting our boat captain’s license now that we have the sea hours and its fresh in our minds. Neither of us necessarily wants to work as a boat captain, but getting the license is a difficult process. We’d like to take on the challenge and learn some new boating skills. I’m planning to spend time with family and friends that I hadn’t seen as much as I liked while over-busy in the past. And we’re both planning to spend more time volunteering. We’re committed to living aboard again in the future as the kid’s schedules and lives allow. Hopefully including a New England cruise next summer and moving back aboard after both kids are out of high school. Before we officially sign off, a big thank you to those of you who have followed our adventures. It was so nice to read your comments and know that there were folks rooting for our success throughout this crazy year. Thank you! If you haven’t had enough details of our voyage, below is a recap of sorts via answers to my many nostalgic questions to the family. Enjoy! Bermuda to Antigua. For all of us, this passage was memorable because the first 2.5 days were a rainy mess. We were cold, wet to the bone and cranky, but we made it through. Erin also found this passage memorable because after the rain stopped, she started to feel comfortable being at sea for the first time. BVI to Key West. Who could forget going up the mast at sea! Provincetown to Maine. Our introduction to Maine’s dense fog and ubiquitous lobster pots made quite an impression on the Boundless crew. Mt Pelee Volcano, Martinique. For most of the hike we were in the dense rain cloud that sits atop the mountain most days. There was very little view and the hike was difficult, wet, and muddy. But we all loved the challenge and the unique environment. We made it to the top of Mt Pelee! Bubble Rock, Acadia National Park, Maine. We spent a beautiful day hiking this easy-going trail and enjoying spectacular views of Acadia. We rewarded ourselves after the hike with the famous popovers and jam at the Jordan Pond House restaurant. Deshaies River, Guadeloupe. We bush-wacked our way up the river and through thick brush, only to get lost in the end. The beautiful, rugged landscape and difficult terrain made for a memorable trek. Hashes, Grenada. We had never heard of a Hash before coming to Grenada but loved hiking through different parts of the island, the focus on fun, and the unique mix of locals, boaters, and students. The beer and singing hash bus were fun too! On On! The Indians, BVI. Doug and I first visited The Indians 20 years ago, and it’s still our all-time favorite snorkel spot with tons of fish and amazing coral, all just a few yards off the side of the boat. This visit was extra special with my brother and his family joining us. Cousteau Marine Park, Pidgeon Island, Guadeloupe. The two nights we suffered at an outrageously rolly anchorage were well worth the great snorkeling at the Jacques Cousteau Underwater Reserve. Andy almost overboard! We were about a day offshore from Hampton, VA, headed for Bermuda. Andy was feeling green and he slipped heading to the rail to be sick. Happily, he was clipped in with a tether on his lifejacket, so all was well, but watching him was Doug’s scariest moment. Erin vs Ocean Wave! Erin was playing in the waves off a beach in Martinique when a wave pounded her and pinned her to the ground, face first. She was terrified that she may have hurt her neck. The wave passed, and she got up shaken with a bloody face. In classic Erin form, she put on a brave face for her new friends, but I was freaked out by her bloody face. Squall! Erin and I were on watch on a very dark night as Boundless left the lee of Dominica on our way to Martinique. The wind unexpectantly died, and we unfurled the sails to catch the light breeze. I checked radar and didn’t see anything. Erin headed below on a bathroom break. The squall hit us like a freight train. Boundless heeled suddently throwing Andy and Doug out of bed and I was blinded by torrential rain. Everyone scrambled on deck to help me as we struggled in the dark with rain and high winds to reef the sails. We got the sails in and the squall passed, but our adrenaline was still pumping. Martinique – Martinique was the best place for meeting other kid-boats and was our first island with a fun and active live-aboard community. And we loved Carnival! Grenada – Yes, Grenada truly is Camp Grenada with all the daily activities organized by/for the boating community. Open mic night, volleyball, yoga, BBQ’s, movie night, hash hikes… It’s no wonder some people live there for years on their boats. Memorial ACTe Museum, Guadeloupe. This museum was a favorite of the entire crew. It’s a modern museum exploring slavery and the slave trade in the Caribbean. The exhibits were interesting and varied and the audio tour (available in English!) was excellent. We met two college professors from the US who came to Guadeloupe just for the museum – it’s that good. Museum of the Banana, Martinique. Hands down the most surprising place we visited. It sounded silly, but turned out to be quite interesting, covering the history, growing, cultivation, and processing of bananas in the Caribbean and throughout the world. And we had a lovely stroll through the banana gardens. Kids in the banana garden. If you look close you can see the remnants of Erin’s face burn. Museum of the Moving Image, Bronx, NY. A gem of a museum off the beaten path in the Bronx, covering a broad range of topics including video games, moving making, Jim Henson’s career and much more. A nice way to spend the day in New York beyond Manhattan. Museum of the Revolution, Havana, Cuba. This was a great example of history being in the eye of the story teller. As an American it was immensely interesting to see Cuba through their eyes and not ours. And interesting to see shot-down US plane and missile parts on display. Cuba. Many parts of the island are naturally pretty, but the architecture and people are truly beautiful! British Virgin Islands. Hurricane Irma was no match for the beautiful beaches, spectacular coral and crystal blue water of the BVI’s! Nor was it a match for the spirit of the people, particularly the people of Jost Van Dyke. Guadeloupe. The mountains and rainforests of the Basse-Terre half of Guadeloupe are spectacular! Le Cap Horn, Falmouth, Antigua. Erin’s favorite pizza was from the wood burning pizza oven along the road between Falmouth and English Harbour. Pizz Boat, Sainte-Anne, Martinique. The pizza was pretty good, but Andy much prefers eating on the boat vs. going out, so his favorite was the Pizz Boat that delivered right to Boundless at anchor via our GPS coordinates! Melini’s, Jolly Harbour, Antigua. Doug liked the pizza at this Italian restaurant right on the water at Jolly Harbour Marina. Le Matis, Deshaies, Guadeloupe. My favorite was a little hole in the wall pizza place off the beaten path in Deshaies that served amazing thin crust pies. Sailing and lobsters in Maine. The Boundless crew agree that Maine is much better visited by land than by sea. The fog and abundance of lobster pots make for a less than peaceful sailing experience. And while most members of the crew prefer Caribbean lobster to Maine, and were tired of lobsters about halfway through our time in Maine, as a native New Englander, I disagree. Ernest Hemingway. Enough about Ernest Hemingway in Cuba already! Yes, he was a good author and a unique character. But he’s not THAT interesting. Ile Des Saintes, Guadeloupe. The Saintes were nice, but did not live up to its reputation from the raves we heard before we left. Guadeloupe in general was a little rough around the edges and not the friendliest. The Saintes were nicer, but we didn’t find the amazing French food we were hoping for, the snorkeling was only pretty good, and other than a fun hike to Fort Napoleon, there wasn’t a ton to do. Next time we’d still stop there, but only for a day or two. Local Theater. Coming from the DC area with national touring shows and being regular visitors to Broadway, we were skeptical of local theater. We were wrong. We enjoyed local productions throughout the US and were consistently impressed by the quality of the performances. Our favorite was Chicago by the Peregrine Theatre Ensemble in Provincetown, MA. Bequia. The second largest island in the Grenadines, Bequia is a beautiful and welcoming island of which few people have heard. The capital, Port Elizabeth, has an active waterfront, a beautiful, long boardwalk along the picturesque shore, and lots of services for cruising boats. And the people are the friendliest you’ll meet. Service Boats. Day-to-day life chores on Boundless were definitely harder than on land. So we welcomed having a skiff come by Boundless at anchor offering a service – same-day laundry service, fresh baked bread, or fresh caught lobster. These services were way underrated! Boston Waterboat Marina. We hadn’t read much about staying here but are glad we did. The Waterboat Marina mooring balls are right off downtown and a quick dinghy ride brings you to the heart of the city. So fun! Cuba. So many surprises in Cuba. It was a lot more fun than we expected, it wasn’t scary, and as Americans, we were welcomed. Cubans generally seem supportive of the revolution and don’t mind the Viva La Revolution, Che and Fidel propaganda all around. And for all Doug’s planning to be in compliance with the US’s Cuba laws, no one ever questioned us about anything or asked for any paperwork. I wouldn’t have wanted to go without following the laws, but it turns out that no one cared to check. Fog. We had no idea how dense and long-lasting fog could be until we sailed (and waiting for the fog to clear) in Maine! No Internet. We knew it would sometimes be hard to get internet from the boat in the islands but were surprised by how many places lacked decent internet access on land. Who knew that many places in Maine have no cell service? And it was often hard to find in the islands. In the end, I think lack of internet was great for us, but it was a surprise. Grenada Invasion. Any Grenadian we asked was appreciative of the US invasion. They feel that it stopped a coup from happening and brought calm and prosperity to the island. We had expected them to be upset about it. Singing Together. Doug was surprised but happy that he was able to convince Erin, Andy and our friend Steve to join him on stage for open mic night in Grenada. It was a highlight for everyone! Antigua Christmas Party. Who knew that a Christmas party would include drunken Santa’s leading a conga line. Not me! Dreadlocks and Stereotypes. From Cheryl, owner of the Fig Tree restaurant in Bequia to Erin and Andy – “Just because I have dreadlocks doesn’t mean I drink or do drugs”. What a fun evening spent chatting with this wise and beautiful lady! Dinghy Safety. Don’t throw your dinghy line to a creepy guy on a dock just because he asks loudly. Tie your line yourself, you’ll do a better job. Avoiding Seasickness. Take Dramamine (the non-drowsy kind) before heading to sea if you think you might get sea sick. If you’re lucky, by the time it wears off in a day, your body will be acclimated to the sea. Island Clothes. Pack less clothes and skip the cotton. Fast drying synthetics are your friend. Kids. Spend as much time doing things with your kids as possible. Understanding who they are and building deep relationships with them by doing things together is priceless. Boat School. Working independently and setting your own pace was hard for the kids. Even with classes from a distance learning school, having flexibility for when assignments were turned in made it hard to self-motivate and stay on track. Loneliness. For very social Erin, learning to live with loneliness and lack of friends was her biggest challenge. Mixing With Strangers. For introverted Andy, the biggest challenge was learning to jump into social situations with strangers at every port. Lack of Lemonade. Andy also wanted to point out the challenge of living without lemonade mix for months before Grandma saved him with a huge stash when she visited in Guadeloupe! What Day Is It? Doug reports that his biggest challenge was remembering what day it was, and sometimes even what month. Sleep. My biggest challenge was sleeping while on passages and learning to function with lack of sleep when I failed. It usually got better by day three, but the first few days were a struggle. Travel, it helps you appreciate your own life and lifestyles different from yours. Go out of your way to meet strangers and learn their story. Take safety seriously, particularly for sailors. Do it every day so safety becomes a habit. Don’t be afraid to follow a different path, even with kids. Question the pressure we put on our kids to make the top team, obsess about grades, and get into the “best” college (remind me of this when Andy’s applying to colleges next year!). Find ways to give kids more responsibility and allow them to step up and manage a little danger. Magnificent! Will miss your trip stories and adventures! You seized the moment, took the leap and have the great memories! What a gift to each other! Now go get those captain licenses! 3 cheers to you 4! Thanks! Hope to see you in the neighborhood and on the Bay! This is, perhaps, your best piece … very, very informative and open. Thank you for giving us the opportunity to follow your adventures. And this last piece is so thoughtful and wise. Welcome back. Thanks! Let us know if you’re in the DC area and have time to catch up. This is it! This is the one I’ve been waiting for. You’e given me a glimpse of “I wonder what it was really like”. This will be certainly one of your family’s most cherished memories. Yes, it will be a year to remember for sure. Fabulous trip. I’ve enjoyed your diary; I always felt like I was there. Consider becoming a blogger as your next work stop. I cannot believe it has been a year?! This wrap was a fun read. Thanks. It I had fun writing it. Hope all is well with you and the SFDO team. I enjoyed following your family travels aboard Boundless. Glad to have met you all and I look forward to venturing via sailboat to many spots you mentioned myself one day! Thanks. We hope to follow you’re travels one day too! Perfect reflections. Thank you for sharing. It makes me want an adventure of our own even more. Looking forward to having you back. I have no doubt that your clan will be off and many adventures! What treasures! Loved reading and watching this journey. You can see the peace and joy in all of your eyes. It’s an incredible thing to have heard you dream about such a voyage and to have seen it come to fruition. Thanks! Its been an incredible year. Welcome back! Can’t wait to see you all again! Thanks. And yes, see you soon! Just WOW! I loved your reflections and truly enjoyed each of all your posts. They all provided amazing insights and great pictures and images of your travels. Looking forward to seeing you and hearing more. What an amazing gift you all gave you your kids and yourselves. Thank you! Thanks! It was fun to capture the trip as we went along. Hope to see you soon! Wow! thank you for a very beautiful picture tour and summary of insights and observations. Today is the first day of the rest of the adventure…. So true! Now to figure out what the next adventure will be. I have so enjoyed following all of your escapades. Thank you for the many opportunities for us readers to have been privy to your lives and experiences, and in such great detail and minutiae, to boot. They are both very happy to be home. But I’m sure getting back to school will be quite a challenge in many ways! I’ve totally enjoyed reading your blog as you progressed on your adventure over the past year. Thanks for sharing not only your experiences but how you grew as a family throughout the journey. You’ve made memories to last a lifetime! Best wishes as you figure out your next steps in the journey of life! Kristin, Doug, Andy, & Erin – What a great adventure! I appreciated all the Facebook photos & updates as well. Kristin – this is a wonderful wrap-up. It would be interesting to revisit this every now and then too. Welcome home and thanks for the ride! Better late than never in reading this and boy was it worth the wait! What a wonderful retrospective on the year and the MANY highlights. Can’t wait to catch up in person soon! This is from Jack C. Friend of Jack B. It has been a real pleasure following your travels. My best to you all in the future. What an adventure ! You have lived our dream and we are preparing to do a similar voyage once our youngest son, who is a senior at Madison High School is off to college. We too, are Vienna, Va locals and would love to have coffee with you to to discuss your experiences and lessons. 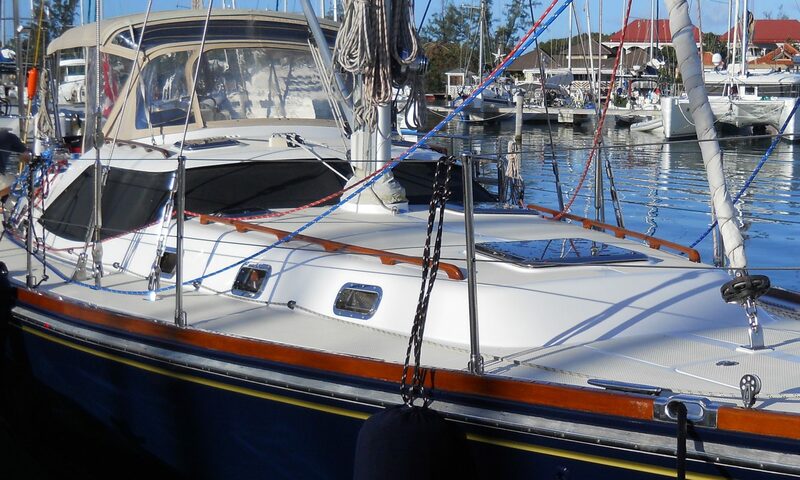 We have sold our existing boat and are in the hunt for the next one. Let us know if you have time to meet up.